Dassault Aviation will showcase its Falcon 8X ultra-long range trijet and the latest version of its Falcon 900LX large-cabin long range Falcon business jet at this year's edition of the Russian Business Aviation Exhibit (RUBAE), which opens on September 12 at the Vnukovo 3 business aviation complex. The 6,450 nm/11,945 km Falcon 8X has been in service in Russia for more than a year and has earned universal praise for its exceptional combination of performance, efficiency and its ultra-comfortable cabin—the quietest in business aviation. The Falcon 900LX on display is a new modernized version featuring the latest upgrades in flight technology and a re-designed interior with contemporary styling and optimized sound proofing. Dassault will also be leveraging RUBAE 2018 to highlight its new Falcon 6X ultra widebody twin, due to enter service in 2022. The 5,500 nm/10,186 km 6X will feature a cabin six feet, six inches (1.98 m) high and 8 feet 6 inches (2.58 m) wide -- the highest and widest in a purpose built business jet. The aircraft will be able to link Moscow directly to New York or Singapore at Mach .85. "The Russian business aviation market remains active and Falcon sales have been solid, especially for three-engine models like the popular Falcon 7X and Falcon 900LX and the new Falcon 8X, which will set a new benchmark in the ultra-long range segment," said Gilles Gautier, Vice President, Falcon Sales for Dassault Aviation. 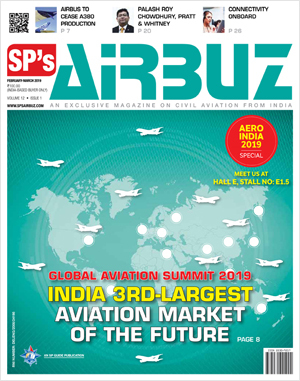 "Equipped with innovative options, notably our revolutionary FalconEye combined enhanced/synthetic vision system and our new FalconConnect high speed connectivity option recently introduced in partnership with Honeywell -- the 8X is expected to sell as well in the region as the Falcon 7X." "But we also expect strong demand for our new Falcon 6X, which will be the most modern, spacious and versatile twin in its class and offer the most advanced digital flight control system on the market," continued Gautier. 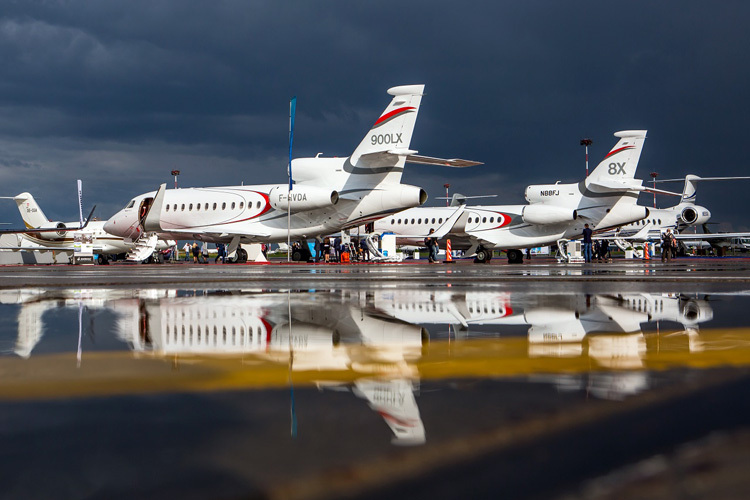 "Our current Falcon 2000 twins, with their unparalleled short field capability, are already proving popular with Russian operators." The Falcon 8X can fly from Moscow to Los Angeles, Cape Town and Darwin or from Rio de Janeiro to Moscow non-stop and land at restricted airports like Gstaad or Lugano, Switzerland, that are typically inaccessible to large business jets. It is even quieter than the 7X, the quietest executive jet on the market – an important consideration for the 14 hour-plus flights for which the 8X was designed. The aircraft's spacious cabin – the longest of any Falcon – can accommodate a wide variety of configurations. A layout featuring a forward galley and lounge bar that can be easily converted into a certified crew rest for very long flights is proving especially popular. Furthermore, the 8X is certified to carry Dassault's revolutionary FalconEye Combined Vision System, the first head up display (HUD) system in business aviation to combine synthetic and enhanced vision capabilities in a single view. Almost all Falcon 8X customers have signed up to use the new FalconEye HUD. Falcon 8X operators can also opt for FalconConnect, a comprehensive package of broadband communications solutions designed to facilitate the use, management and control of inflight connectivity. Offered through Honeywell GoDirect, FalconConnect integrates onboard communications into a single all-in-one offering and provides a single source for hardware, services and technical support, giving passengers, crew members and operators full knowledge and control over consumption and costs. The FalconEye and FalconConnect options are also available on the modernized Falcon 900LX, which is expected to remain the industry benchmark for reliability, versatility and fuel economy in the 4,750 nm/8,800 km segment for years to come. Optimizing after-market support is a top priority at Dassault, as evidenced by recent surveys that have placed the company at the top of the industry in terms of aircraft reliability and the quality and dependability of support services. To ensure it can continue delivering top-notch support to Russian operators, Dassault has significantly reinforced and expanded its regional service network in recent years. The company recently set up a new stock of spare parts at Vnukovo 3, near the Dassault Falcon Services satellite service center, to further facilitate the distribution of spares within Russia and the CIS. Russian customers can also count on Falcon Response, Dassault's comprehensive suite of AOG services. In the short time since its introduction, a number of operators from the region have already benefited from the dedicated Falcon 900 missions made available by Falcon Response to handle AOG situations and if necessary provide alternative lift – an industry first.